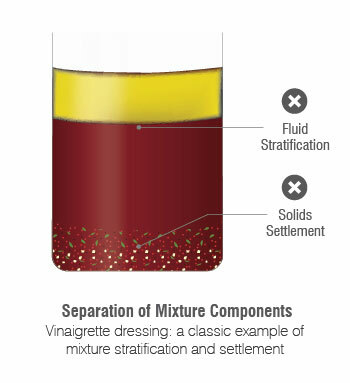 To identify potential mixer applications for liquid products, consider the composition of oil and vinegar salad dressing, as it depicts the two greatest challenges addressed by mixing: separation of non-miscible fluids and the settling of solids. Any liquid that separates or settles over time is an opportunity for a mixer application. For these liquids, which are known as non-homogeneous, maintaining their uniformity is critical to maintaining their quality. If a product isn’t brought into uniformity in production, or just before it’s used, the quality of that product is lost. That’s why oil and vinegar salad dressings need to be shaken before consumption. Without shaking, you’d have to eat the oil layer first, then the vinegar layer topped off with an herb slop. Like many chemical applications, the key to the best quality salad dressing is good agitation just before application. If you’re looking for mixing opportunities, you’ll want to not only consider the plant’s process mixers, but the product inputs as well. While many of our mixer designs are engineered as part of the production process, we see many processes fail before they start because of uniformity/quality issues with input chemicals or liquids. This problem is more commonly an issue related to product quality rather than contamination. The reason is that contamination usually occurs at the point of application and can be realized, while uniformity of an input product is assumed, but lost inside the shipping container. The problem is not the process, it’s that the inputs aren’t brought to specification. To address this issue, we’ve developed several lines of mixers specific to bulk containers: MMX and ITM.